Houghton, MI – July 10, 2018 – ProNav Marine continues to innovate as a leader in boat control technology with the all new patent pending ProNav Angler MotionTM. This revolutionary, industry-first gesture controller gives recreational and tournament anglers the edge they seek with PointDriveTM point-and-go driving, PointJogTM automatic positioning, and an arsenal of additional features to make boat control easier than ever. 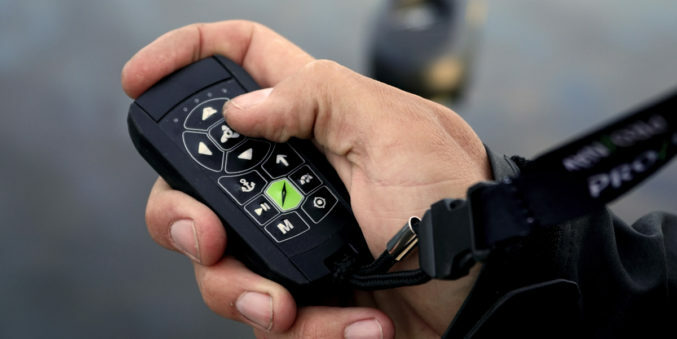 ProNav Angler Motion is a waterproof, handheld controller that pairs via Bluetooth with the ProNav Angler, a GPS autopilot for electric trolling motors, to give you complete boat control independently from or in conjunction with the ProNav Angler mobile app. manual adjustments to get from Point A to Point B. Instead you can simply make adjustments, from anywhere in the boat, by pointing where you want your boat to go,” said ProNav CEO Travis White.